Several of the pictures included here are courtesy of Mrs. Anna Mosby. Lloyd Mosby was a Motor Machinist's Mate 2nd Class on the USS LST 325 during her WWII service. The LST-325 was launched on 27 October 1942 and commissioned on 1 February 1943, with Lieutenant Ira Ehrensall the commanding officer. On February 17, during her shakedown cruise, Lt. Ehrensall was transferred to the USS LST-391 and Ensign Clifford E. Mosier replaced him. 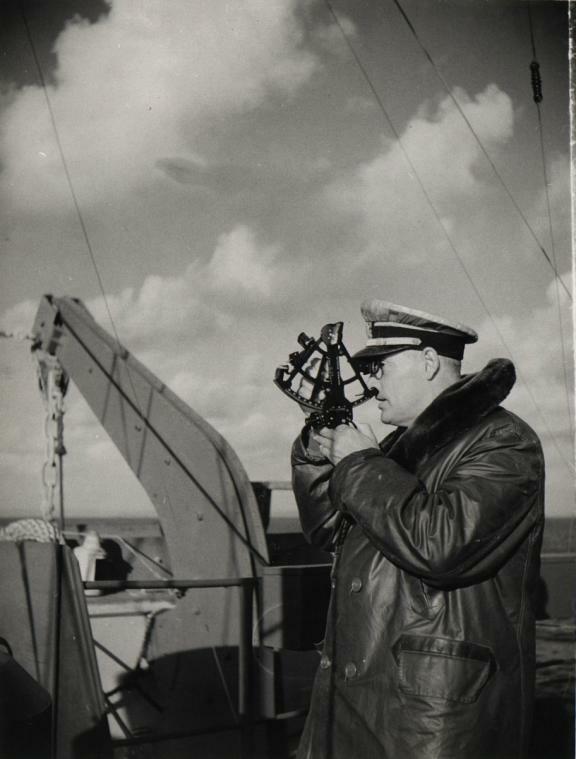 Mosier would remain the ship's commanding officer until June 1945. At the completion of her shakedown cruise in and around Norfolk, Virginia the LST-325 sailed to New York, New York. From there the LST-325 left on 19 March for Oran, Algeria following a brief stop in Bermuda. LST-325 arrived in Oran on 13 April 1943 and spent the next three months going between the ports of Arzew and Mostaganem. During this time she practiced loading and beaching operations with various American and English Army units. 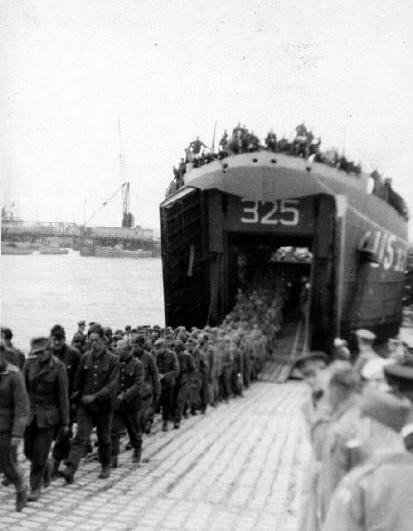 On 28 June LST-325 arrived at La Goulette in the Bay of Tunis to prepare for Operation HUSKY, the invasion of Sicily. On July 10 LST-325, as part of the KOOL Force (the floating reserve for the DIME Force going ashore at Gela) left Tunis, arriving in the Bay of Gela on 11 July. They remained here until the morning of the 12th before unloading the vehicles and men of the 1st Armored Division onto LCTs. They made six more trips to Sicily in support of the offensive before Messina fell on 17 August, twice bringing back loads of Italian prisoners. On 6 September 1943 while in Bizerte, Tunisia four members of the crew were injured during an air raid. On 13 September LST-325 sailed as part of the Northern Attack Force in support of the invasion at Salerno, Italy carrying elements of the 40th Royal Tank Regiment. Four members of the crew and four British soldiers were injured during an attack by German fighter-bombers as the ship entered the attack area. LST-325 made four trips to the beachhead at Salerno, the last trip carrying members of a Ceylanese infantry regiment from Tripoli, Libya. In late October 1943 LST-325 returned to Oran, leaving there on 12 November as part of a large convoy of ships for England. On 21 November the convoy was attacked by German bombers using the new remote-controlled glider-bombs. Several transport ships were sunk and one passenger aboard LST-325 was severely wounded by shrapnel. LST-325 entered Plymouth, England on Thanksgiving Day, 25 November 1943. From December 1943 until March 1944 LST-325 was involved in several training exercises along the southwestern English coast before receiving upgrades in preparation for what was to come. On 5 June 1944 LST-325 sailed from Falmouth, England carrying elements of the 5th Special Engineer Brigade. 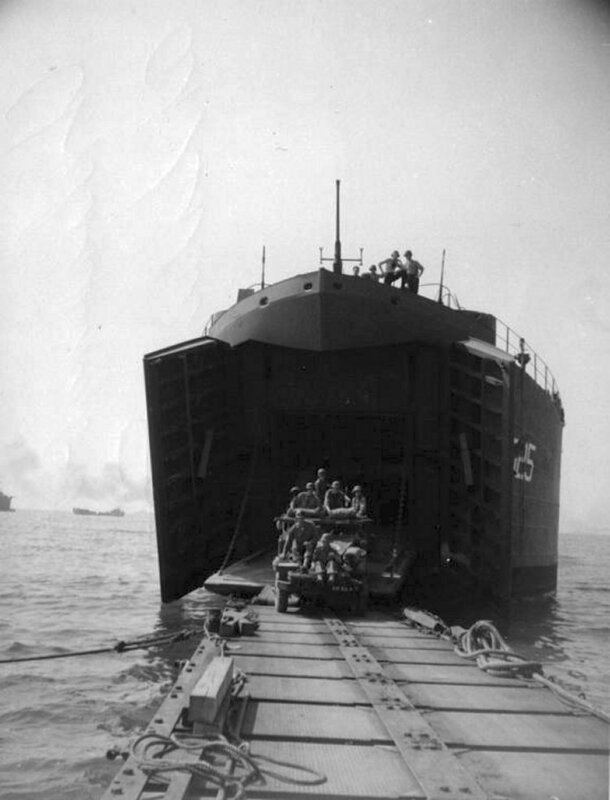 LST-325 was part of Force "B", the back-up force for the troops going ashore at Omaha Beach on 6 June. 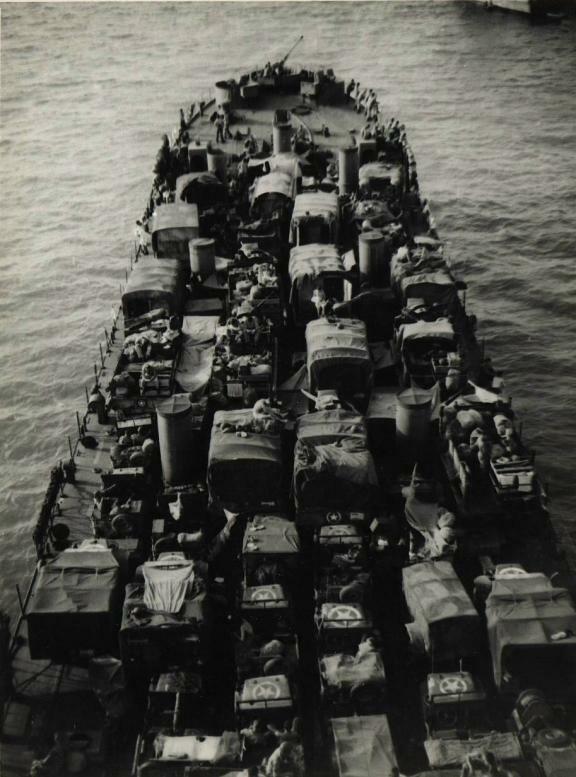 On 7 June they anchored off Omaha Beach and unloaded the men and vehicles onto DUKW's and LCM's. Between June 1944 and the end of April 1945 LST-325 made 43 round trips between England and France, unloading at Omaha, Utah, Gold, Juno and the city of Rouen on the Seine River. Twice they carried loads of ammunition from Omaha Beach to St. Michel on the western shore of the Cotentin peninsula for the Army besieging the port city of Brest. On 28 December 1944 the LST-325 helped rescue approximately 700 men from the troop transport S.S. Empire Javelin, which had been torpedoed off the coast of France. Lt. Comdr. Mosier was awarded the Bronze Star for this rescue. 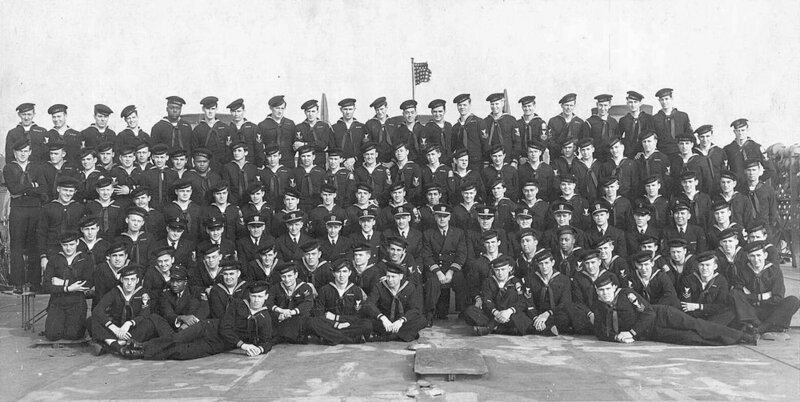 On 12 May 1945 LST-325 sailed with a convoy from Belfast, Ireland to return to the United States. Two days out from Belfast the convoy was hit by a terrific storm and scattered. LST-325 slammed bow first into a monstrous wave and a crack developed across the main deck. Ship fitters were able to save the ship by welding steel plates across the damaged hull. Blessed by fair weather the rest of the way LST-325 sailed into Norfolk, Virginia on 31 May 1945. From Norfolk LST-325 sailed to the shipyards in New Orleans, Louisiana. There the damage caused by the storm was repaired and the ship was fitted with the "Brodie" equipment, a system used for launching and retrieving light observation aircraft from an LST. The ship went on a shakedown cruise in August 1945 to test this new gear. The day before the ship was to sail to the Pacific the news came that Japan had surrendered and the war was finally over. After a trip to Panama in late September, LST-325 was sent to Green Cove Springs, Florida and decommissioned on 2 July 1946. LST-325 was reactivated in 1951 for service in Military Sea Transport Service arctic operations. She was involved in Operation SUNAC (Support of North Atlantic Construction) in the Labrador Sea, David Strait and Baffin Bay in 1951-52. This operation was involved in constructing radar outposts along the coast of eastern Canada and Greenland. In 1961 LST-325 was again taken out of service and became part of the National Defense Reserve Fleet. LST-325 was again reactivated in 1963 and transferred to Greece in May 1964. Named Syros (L-144) she served in the Greek Navy until December 1999 when she was decommissioned for the third time. In 2000 she was acquired by The USS Ship Memorial, Inc., and sailed back across the Atlantic for the final time, arriving in Mobile, Alabama on 10 January 2001. 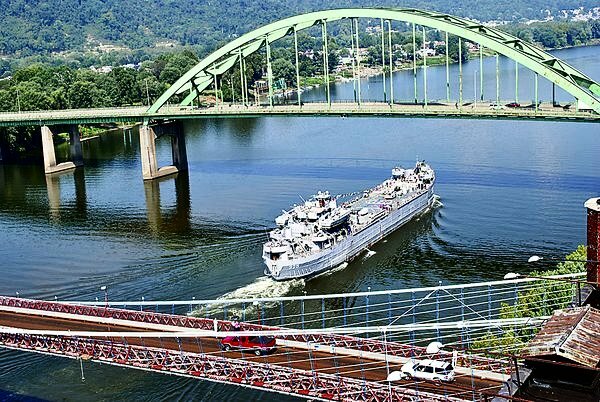 One of only two World War II LSTs to be preserved in the United States, LST-325 is currently docked in Evansville, IN. She has become a museum and memorial ship to the men who bravely served their country aboard LSTs. Dave Bronson is the son of James Bronson, MoMM1, LST-325, 1943-1945 (shown at right). Long before LST-325 was chosen as the LST Memorial Ship, Dave had begun compiling research materials on the ship's and crew's histories. In 1999, he assembled together with several of his Dad's shipmates; at that time, he conceived the idea of compiling his work into a book for the ship's "family," in time for another reunion in 2001, to be held in conjunction with the national LST reunion being held the same year in Mobile, AL. Imagine his surprise when the LST-325 was ultimately chosen! Suddenly, his knowledge and expertise is in great demand. We're thankful that he took time away from his book to make this excellent contribution to the website and to the public. Thank you Dave, and Bravo Zulu! Dave was involved with the ship since its arrival. He not only provided this series, but he has also served on our Steering Committeee, wrote the ship's history for the website, and most recently he published a definite and interesting history of the ship, "Mosier's Raider's: The History of the LST-325". That book is now available in our Gift Shop and on our website. Dave will be sorely missed, he was a hard working man. PLEASE NOTE: All pictures are copyrighted by their respective photographers, most notably Ted Duning. Reproduction by any means is prohibited without prior permission.